Every avid movie buff can tell you that half the fun of watching something on the big screen comes from the complete and total build-up of the surroundings. You are sitting in the most comfortable chairs, the walls are clad in light-absorbing fabric, the surround sound system enhances the sound effects and the only thing that truly exists in that moment is you and the screen. Sounds like the perfect movie watching experience, right? But when it comes to home theaters, there is one thing that should never, ever be taken light. Shades and curtains are among the top priorities for a home theater and picking one requires a lot of careful thought and deliberation. Sunlight can be a major pain when looking at a screen, and so can be any other external light. It can cause distractions and take away from your movie-watching experience, so the fabric should always be chosen carefully. To help you with that, we’ve compiled an extensive guide for picking shades for your home theater right here! A maltreated window in a home theater can mess with the audio-visuals. Infiltrated light can result in side-glare and poor sound quality. 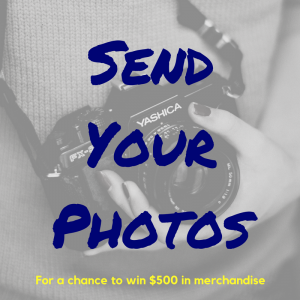 One of the best ways to rectify all of this would be by opting for Motorized Window Shades. 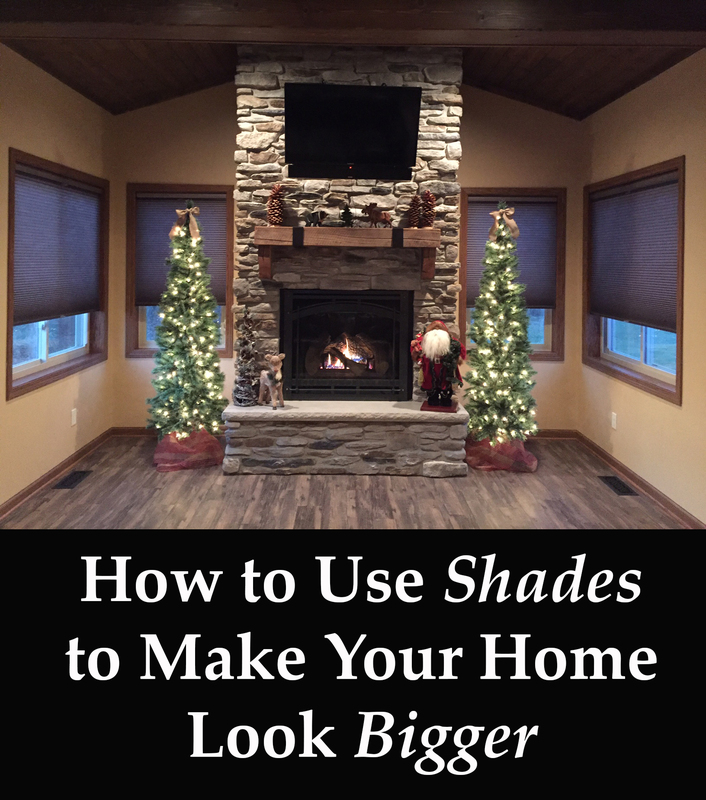 The best thing about such shades is that you would not have to tussle with any cords or chains – you can simply lower them with the press of a button from your smartphone or tablet. This is an especially beloved window treatment solution for smart, partially automated homes. Motorized window shades are specifically designed to tightly cover the window frames to stop any external light and sound penetration. Moreover, most motorized window shades are available in different styles and finishes, which lets you complement your running interior design theme as well. This results in a true cinematic experience, where you can just sit back and enjoy the movie without compromising on the aesthetics at all. They say, “Old is gold,” and this adage has never been more appropriate then with the use of old-school drapes in a state of the art. Fabric is one of the best sound absorbers, so any echoes and rifts that occur due to any reason – for example, the atypical dimensions of your room – can be easily taken care of if you use drapes as your window coverings. The kind of fabric you choose for your home theater matters a lot. Most natural fabrics work better than synthetic ones. Therefore, your top picks should always be between cotton, wool and silk. However, you should avoid thin fabrics because sound waves tend to pass right through them, and the resulting bounce on the window panes can cause resonance and echoes. Drapes with thick fabrics and back lining are the ideal choice. The best part about choosing drapes or curtains for your home theater window covering is that you can customize the design and color according to the theme of the room. If you want to opt for a lush, classical theater theme then you can go with flowing red drapes to add decadence and richness to the ambiance. 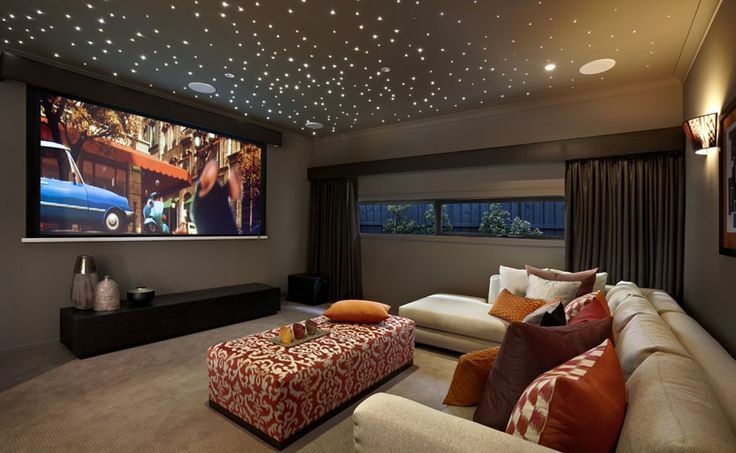 Similarly, you can choose sleek, glitzy modern curtains to complement your contemporary themed home theater. 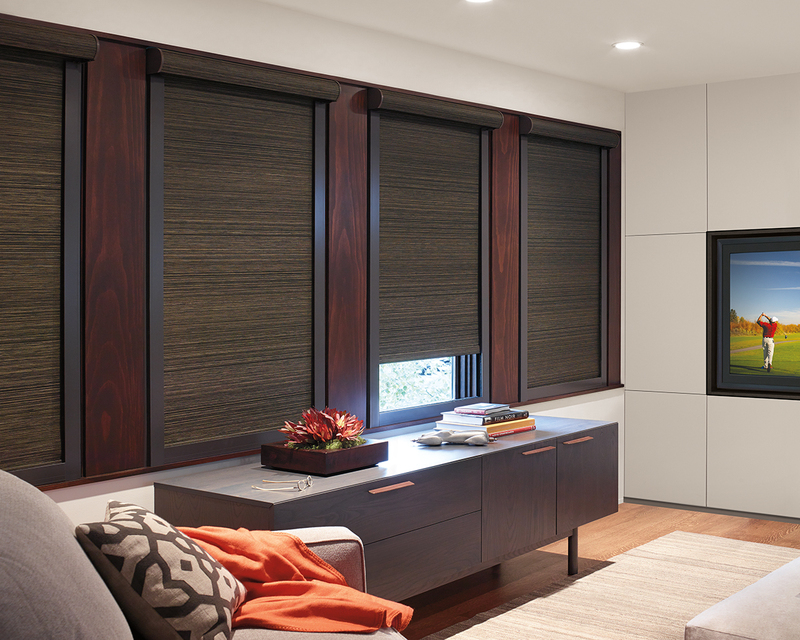 One of the best choices for home theater window coverings is Blackout Shades. This treatment is sure to block out all external feedback from disrupting your movie-watching experience. Blackout shades also reduce the amount of heat transferred within your home theater by a whopping 24%. This means a more efficient use of your air-conditioning systems. These shades provide maximum light blockage, which is excellent when you want zero distractions and light glare. They’re also available in a number of different styles and light control options, so you’ll have a lot of liberty choosing which style fits your interior design the best. However, one thing that you should probably keep in mind is that not all of these shades are frame hugging. This basically means that light may enter from the sides, which would create an almost halo effect. Roller Blinds – These would look excellent in a simple, clean modern style interior design. Curtains With Tracks – If you’re opting for an old-school theme for your home theater, then this would be the perfect window covering. Multilayer Treatments – These window treatments are usually an amalgam of side panels, cornice boxes or valance. They’re customized and give the space a distinct aura. 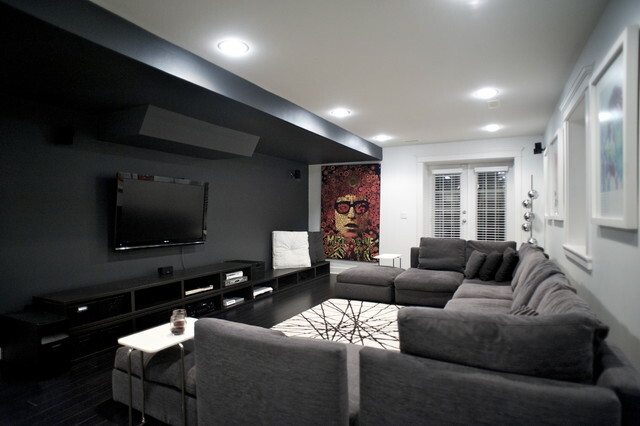 Looking for something sleek, sophisticated and cool to give your home theater that extra visual and acoustic oomph? Mini Blinds are a great choice for doing so. These consist of slats that are around 1” in width and can prevent external light from entering a room. 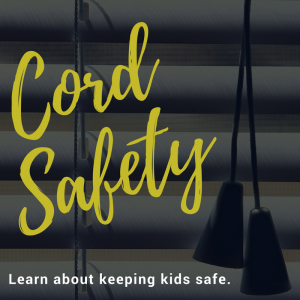 While not as good as Blackout Shades, mini blinds still provide adequate light control and come in affordable options to boot! They can be easily controlled with the help of a wand or a lift cord. Mini blinds are also very easy to maintain – you can use either a feather duster, a vacuum cleaner or even a damp cloth to keep them spick and span. Mini blinds are available in a number of different finishes. They’re made of aluminum slats, which can be powder coated in several textures and colors. 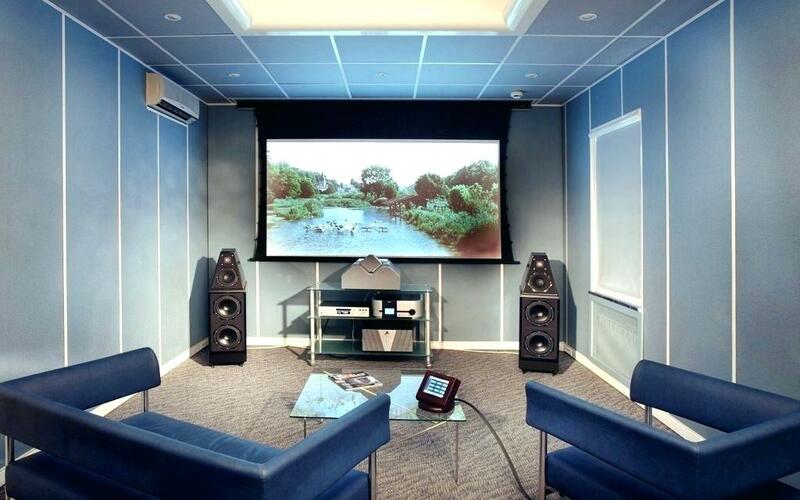 So, you can easily find one that will match the color scheme and overall interior design theme of your home theater. If you want your home theaters to feature a look that is pleasantly unconventional, then the Bamboo Woven Wood Shade with blackout liner would be the best option for you. It’s a truly unique product that can completely filter out the glare and make your home theaters as dark as possible. It’s make from very distinctive products – including hand-woven bamboo, grass and jute fabrics – which adds to its charm. The blackout lining at the back helps reduce external noise and light glare, which is definitely crucial for a truly amazing movie-watching experience. Its added charm comes from the quirky aesthetics. This kind of a window treatment features a selection of some extremely individual patterns and wood grains that will definitely add an unusual charm to your home theater setting. Its organic visuals make this window covering the perfect choice for home theaters that boast a rustic, prairie or cottage style set-up. So, these are some of the window treatments that you can choose from on your search for the perfect coverings. These are great at filtering out most external feedback, so can enjoy a holistic and serene movie experience. 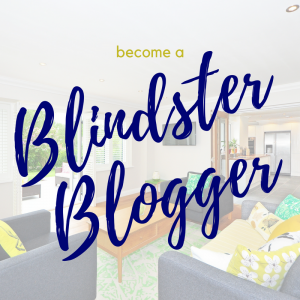 This article was contributed to Blindster by Katie Porter, an aspiring writer, movie lover, and part of the team at Seatup. 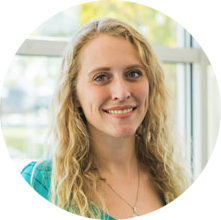 In her free time, she enjoys exploring her home state Colorado and plays in women’s amateur rugby league.